It is game day, and instead of feeling my incredible self that wants to get in on some spinach dip with fresh bread, I am feeling quite under the weather. I figured it was time to pull out an appetizer that was healthy and delicious. I serve this up in small glasses as the muse for a dinner, and then keep gallons of it in the fridge to last the rest of the week. I started out this recipe by snatching up my copy of Voluptuous Vegan by Myra Kornfeld. In the first few pages she gives different vegetable stock recipes, and I personally think her Southeast Asian Stock is IT. I used this stock as the base of this recipe, and it really gives it that asian authenticity. I decided to use eggplant in this recipe because most people use tofu, and a lot have not ever prepared eggplant before! I am a big defender of tofu such as my Teriyaki Baked Tofu recipe, but it often becomes a crutch and I can admit I sometimes use tofu and soy too much. Eggplant is a great substitute for tofu in many recipes you will find, and I for one prefer it! Even though I am under the weather, I am not to sick to take a shot…with the soup it should kick this cold! Makes 6-8 servings or use it as a muse and eat it the rest of the week! 1. Preheat oven to 350 degrees Fahrenheit. Place all of the vegetables in a large stock pot and bring to a boil. 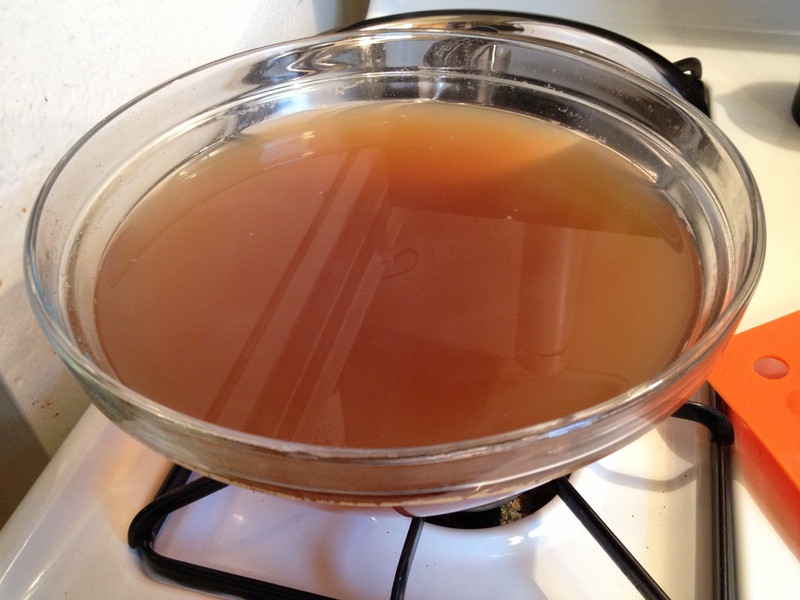 Reduce the heat and let simmer for 45 minutes until the stock develops some color and flavor. Drain over a bowl through a fine mesh sieve and push to extract as much of the stock as possible. 2. Meanwhile, cut an x-marks-the-spot across the eggplant and salt the eggplant. This will cause the eggplant to sweat out the bitter flavor that we don’t want to eat. Let sit for 20 minutes and then squeeze delicately to release excess moisture and pat dry with a cloth. Then cut the eggplant into cubes for the soup. 3. While the stock is being cooked and the eggplant is sweating, cut up the shiitake mushrooms. Place them on a baking tray and mix with some olive oil. Sprinkle with salt and bake for 30 min- 1 hour depending on your slices. Check every 10 minutes or so to separate them from the baking tray and mix them up. They are done when crunchy and taste of bacon. My omnivore friends agree, they really do taste like bacon. 3. Heat the oil in a large stockpot over medium heat for 1-2 minutes. Add the onion and carrots and saute for 7 minutes, then add the cabbage and saute until the onion is tender. Pour in the stock and add the rest of the ingredients. Bring to a boil, then reduce heat and simmer for 40 minutes, or until the cabbage and eggplant are both tender. 4. 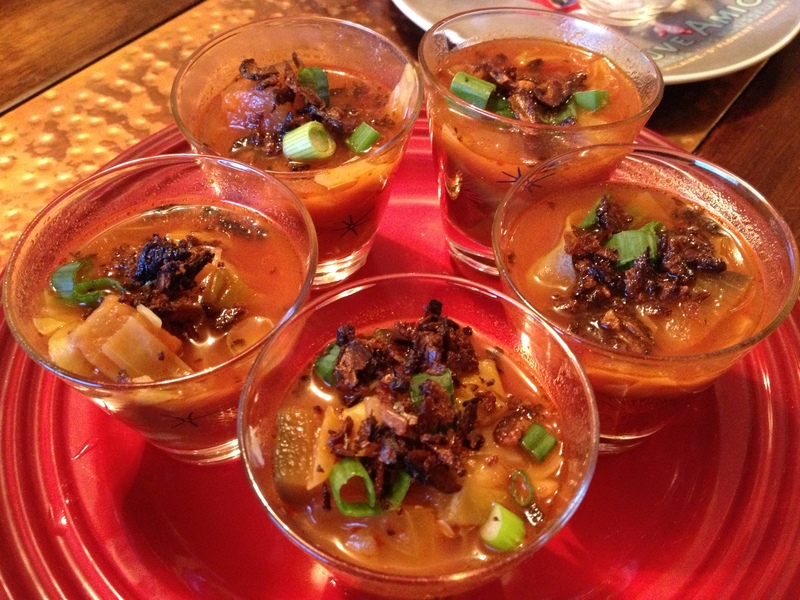 Serve in small glasses or large bowls with “bacon bits” and sliced green onion. Enjoy.